The Cigars that made my top 15 list may not have all been released in 2012 but I smoked and enjoyed them all for the first time in 2012. If you have not tried any of these cigars, I think you are missing out on some sweet sticks! I know 2013 will be an even better year! I also have some exciting stuff in the works and it should be unfolding soon. Visit dangumm.com for more reviews! A few weeks ago AKA Cigars released their newest blend the "Solace". This cigar features all aged tobaccos and a Ecuadorian Connecticut wrapper and my friend Jay at AKA sent me a few sticks to review. Since the Hybrid and Respect are two of the finest cigars made, why would the Solace be any different. 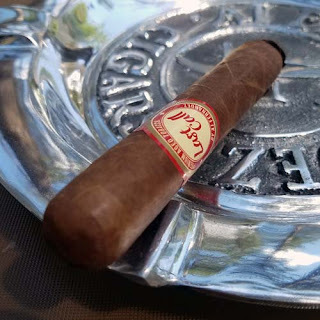 I know first hand that if you look at the picture below and see the smooth shade-grown Connecticut wrapper you want to think this is just another top-shelf Connecticut cigar, but that's not the case at all. This definitely isn't your mama's Connecticut! So, lets see how the Solace pans out. Once this cigar was unwrapped and in-hand it did look like any other top-shelf Connecticut wrapped cigar, but from that point on nothing was ordinary about the Solace. This stick was packed well and the cold aroma had a slight floral aroma with hints of honey and toast mixed in. Once the end was clipped the cold draw was free and even with notes of toast, tobacco and a touch of earth. Nice! Once the Solace was lit, I knew I was in for a treat. The first puffs were pure sweet cream then about 1/4" into the stick hints of white pepper joined in along with a ceder like spice and then a touch of earth. By the mid-point the white pepper had transformed into black pepper adding a bit more kick to the strenght. In the final third the cream came back along with some toast and some white sugar giving the Solace a long and tasty finish right down to the nub. Overall this was a great cigar and is now on my "to buy" list. It had all the creamy goodness of a traditional Connecticut cigar, but it had an added kick from the spice. AKA did it again with this one! If you are looking to depart from the norm, this just may be your cigar.